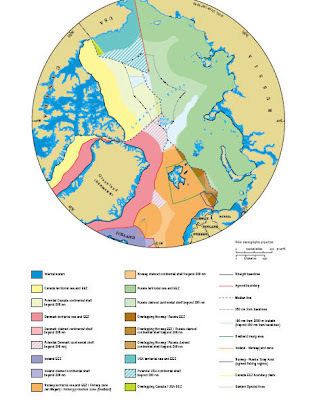 Interesting map showing the various territorial claims that countries (Iceland, the U.S., Canada, Russia, Norway, and Denmark) have made on the Arctic, which may contain "as much as a fifth of the world’s yet to-be-discovered oil and natural gas reserves..." according to the United States Geological Survey (see link below)... Just one part of the world where there are territorial disputes. Map developed by Durham University's IBRU. Quote: "The International Boundaries Research Unit works to enhance the resources available for the peaceful resolution of problems associated with international boundaries on land and at sea, including their delimitation, demarcation and management. Since its foundation in 1989 IBRU has built up an international reputation as a leading source of information and expertise on boundary and territorial issues around the world." It is likely that these will not become "hot", unlike many other locations on the planet viz. 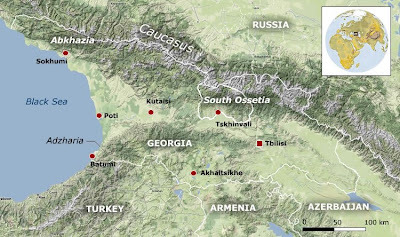 the situation in South Ossetia between Georgia and Russia!